of the blessing you are as He takes great delight in you. Thomas Kinkade - Birthday - 12 Boxed Cards was published by Dayspring in December 2009 and is our 371st best seller. The ISBN for Thomas Kinkade - Birthday - 12 Boxed Cards is 081983384660. These Thomas Kinkade cards are just right - for men or women. Got a question? No problem! 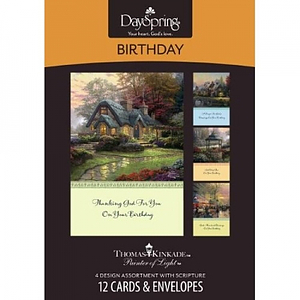 Just click here to ask us about Thomas Kinkade - Birthday - 12 Boxed Cards.